During the week of spring equinox (vernal equinox) , families visit cemetaries to clean and maintain graves. They also pray for their loved ones, burn incense and offer them flowers and food. The spirits are known to prefer round food, so botamochi (round glutinous rice balls covered in bean paste) are eaten on this day. The treat gets its name from botan, Chinese peonies which bloom in the spring time. The Adzuki-beans used for the sweet red paste (anko) are symbollically used to drive out the bad spirits. The same type of sweet is eaten at the autumn equinox. It is then called "O-Hagi", since it looks like the bushclover (hagi　萩). Read more botamochi haiku by Issa HERE ! The Temple was erected in 1606 based on the story dating back to the 13th century. There was an observatory deck on this site which was built for Yoritomo Minamoto (1147-1199), the founder of Kamakura Shogunate. In case bird-releasing games were held at the beach of Kamakura, Yoritomo came over here and watched the show. Serving him and his guests was a nun called Nichiei (1187-1274). In 1271, the year unforgettable for the Nichiren Sect Buddhists, Priest Nichiren (1222-1282), the founder of the Nichiren sect, was sentenced to death on charges of his fierce criticism against the government policy. He had also reprimanded all other religious sects saying they were fallacious, false and even dangerous to the welfare of the country. True Buddhism is, he argued, in the Lotus Sutra and unless the government follow his suggestion, the country would continue to face natural disasters and social unrest. On September 12 of the year, Priest Nichiren was on the way to the execution site at Tatsunokuchi located at the west-end of Kamakura, passing near this observation deck. The devout gathered here anxious to see him, expecting it would certainly be the last chance, and were in a sorrow of parting. Suddenly appeared before him was Nun Nichiei, an ardent devotee of Priest Nichiren, and presented Botamochi, or rice-cake dumplings covered with sesame paste. It was obvious to everybody that he would be executed within hours. However, she believed that the great Priest would survive, come hell or high water, with his messianic charisma. Yes, a miracle occurred at the last moment. He was brought down to the site for beheading that night, and the executioner hold up the sword to decapitate, when the area was hit by a stroke of lightning. Back then, lightning was thought one of the most feared super-natural powers or a divine act. The executioner was terrified and had to suspend the execution. Priest Nichiren's life was thus saved. His followers believed that the Botamochi Nun Nichiei gave to Priest Nichiren must have saved his life. In reality, Nichiei entered nunhood after her husband died. Her husband was also a pious devotee of Priest Nichiren. Meanwhile, she had a younger brother Nissho (1221-1323) by name (same name as the founding priest of the Temple in alphabet, but a different priest). He was one of the Six Great Disciples of Priest Nichiren and founded Jissoji, another Nichiren sect temple. On September 12 every year, the Temple holds a memorial service for Priest Nichiren. The devout cook Botamochi and distribute to visitors after offering it to the altar in honor of Priest Nichiren. At the same time, the Temple dedicates this Botamochi to the statue of Priest Nichiren at Ryukoji, where another memorial service takes place on this particular day. Nun Nichiei and her husband, who was a retainer of Sixth Shogun Munetaka (1242-1274), were buried here and their Gorinto (five-tier stupa) tombs are placed beside the main hall. From Hiratsuka town on the Old Tokaido, at the temple Hozen-In 宝善院. The village was poor in former times and had not much rice. Many children died of malnurishment. When the cold wind blew from the west in Hiratsuka, many children died. And their mothers could only cry for days on end, when they had to abort their children in the river. One day the poor mothers collected money to build a statue of Jizo and prayed to him for help. They prayed to be able to give at least one plentiful meal of a mochi to their children before they would die anyway ! Many graves of babies are here and all others, who could not even affort a grave, are also prayed for here.
. . . CLICK here for Temple 宝善院 Photos ! At the temple Choen-Ji in Ichigaya, Tokyo. It is said to help mothers after childbirth to get well soon. Jizo appeared as a young priest and gave some botamochi to a poor mother to help her provide milk for her baby. "botamochi falls from a shelf"
something good can happen unexpectedly, without your own effort. Nichiren was famous for his preaching at the crossroads of Kamakura (tsuji no seppoo 辻の説法). This hokku comes at the end of a haibun passage in Issa's My New Year (My Spring) and depends on the haibun for much of its meaning. The haibun is the third consecutive passage about unfortunate stepchildren, and all three passages allude to the fact that Issa himself lost his mother at age two and later suffered so much as a stepchild after his father remarried that his father sent him away to Edo when he was fifteen. The haibun passage makes it clear that the "buddha" in or by the grove or thicket in the hokku is a stone statue of the bodhisattva Jizo, famous for his mercy and for the help he gives to children, pregnant women, travelers, and those with eye ailments. Bodhisattvas and other revered figures in Buddhism were customarily referred to as buddhas, as were newly dead souls, and the haibun makes it clear that this isn't a statue of Shakyamuni Buddha or any other main buddhas in the narrow sense but, rather, a statue of the very popular bodhisattva Jizo. In the haibun, Issa relates a legend from Tatsuta, near Nara. A cruel stepmother deprives her stepson of all food for ten days and then torments him further by giving him a bowl of rice and telling him he can also have a bowl of rice if he can get the stone statue of Jizo nearby to eat the rice in the bowl. After the boy places the bowl offering before Jizo he clings to the stone sleeves of the statue and prays as hard as he can to the bodhisattva. Then a miracle happens, and Jizo gobbles down the rice like a hungry child. When the boy's stepmother hears what happened, she changes her ways and from then on treats her stepson just as she treats her own son. The statue of Jizo, Issa says, still stands, and countless people give him offerings. The hokku is about one of these offerings, which Issa imagines. Sweet rice balls, literally "peony (botan) rice balls," are different from the large round "mirror rice cakes" made and eaten at New Year's and also presented to temples on the death day of Shakyamuni, the historical Buddha. The rice balls are made partly of the sticky rice used in the larger rice cakes and partly of ordinary rice. After these two kinds of rice are cooked and made into balls the size of small dumplings, the balls are covered with a sugar-sweetened paste or jam made mainly of partially mashed red beans. Sometimes the paste is fairly smooth, and sometimes it's a bit lumpy with slightly-mashed red beans. The rice balls are a treat and a worthy offering to Jizo, who is believed to love the sweets of the children he protects. In Issa's hokku, believers are implied to be happy because they are able to present delicious things to Jizo with the expectation that he will eat them, and Jizo also seems very satisfied and happy to receive the sweet rice balls. Together Jizo and believers enjoy the moment as a mild spring breeze blows. Of course the eating the bodhisattva statue does is invisible, but it seems to be implied by the invisible yet pleasant breeze. Issa is presumably happy about this situation, and his hokku may be his virtual-world plate of sweet rice balls that he is presenting to the Jizo statue near Nara, far from his hometown in the highlands of Shinano. In the original legend, which Issa uses as a parallel narrative that resonates with his own situation as a stepson, the boy presents a bowl of rice to Jizo, so it's natural that the mature man Issa would present a hokku about sweet rice balls, which are even more delicious. Of course Issa must have been aware that if the legend was true, it meant that the boy cheated by eating the rice himself and then lied to his stepmother and thus achieved happiness through (unavoidable) cunning and deceit, though Issa must also be aware that the legend implies that the boy himself became (or became one with) Jizo for a short time and ate the rice as Jizo, so his deceit resembles literary creation. Perhaps Issa is suggesting that the invisible eating being done by the stone bodhisattva resembles the sleight of hand that allows a hokku to taste just as delicious as a physical rice ball and to offer pleasure that lasts even longer than the sense of taste allows. In any case, Issa's hokku seems to be meant to honor and spiritually feed Jizo and may imply that, inspired by the legend, it was written by Jizo through Issa. With the placement of this hokku next to the haibun and hokku about Jizo, Issa may be linking the creation of his first hokku with the invisible eating done by the stone bodhisattva and the boy. This hokku is probably from 1810, when Issa was mostly in the area just east of Edo.
. Read the comment by Chris Drake . In Japan, myōbu (命婦) is a title which was given to ladies of the fifth rank in the imperial court or to midrank noblewomen. In The Pillow Book, Lady Myōbu was also the name of a pet cat belonging to Empress Consort Sadako, whom the author Sei Shōnagon served. This title is commonly associated with the kitsune fox messengers of the rice deity Inari, for reasons that are obscure. Japanese folklore contains several stories that suggest explanations for the connection, mainly involving the Fushimi Inari Shrine on Mount Inari near Kyoto. On this mountain are a vast number of shrines, mainly to Inari, but also to other deities, including a fox deity named Myōbu. 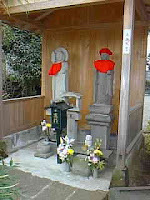 The Fushimi shrine itself contains smaller shrines, including the Byakko-sha ("white fox shrine") and the Myōbu-sha ("court lady shrine"). Legends connecting kitsune to the title myōbu . . .
Kitsune who did not follow Inari are often referred to as Nogitsune.
. haru higan 春彼岸 spring equinox .
. Fushimi Inari Taisha 伏見稲荷大社 Fushimi Shrine . ***** "Ricecakes in difficult times"
Read the above story about Nun Nichi-Ei and Nichiren for the background of this ceremony. On December 1 is the day of Kappare カッパレ（川入り） going into the water. Once upon a time a mother was worried about her son who went to the beach swimming every day. She worried he might be eaten by Kappako かっぱっこ（河童）. So she made him many botamochi ぼた餅 rice cakes to feed to the Kappa and spare his life instead. Botamochi are given to エビス様 Ebisu. moo inoko ka もう亥の子か (a pun with moo ii kai? in a children's game). Kichigo 吉吾 sat under a tree and asked the Tengu what he feared most. The answer was いけが（茨 ibara）wild roses . A few days later when the Tengu was asleep, Kichigo placed a lot of wild roses around his bed. As a revenge, the Tengu now threw many peony cakes down the roof of Kichigo's house. Kichigo picked them up and ate them all.